We left the hostel this morning to walk by the bike shop and see if it actually existed, but we couldn’t find it! We went back to the hostel and double checked the address, and we were looking in the right place. We went back, and we found it! You couldn’t tell it was a bike shop when you walked by because all the windows had big wooden doors over them. We waited until it opened at 10, and we asked about bike boxes. They didn’t have any. But, we asked if they knew of another place where we could get them, and they directed us to another bike shop that was only 500m away. Our entire conversation took place in minimal English and German. The guy at the bike shop said he didn’t speak English or German, but he actually spoke and understood enough for us to communicate. We went to the other bike shop, and they had boxes! The man actually took the new bikes out of the boxes and gave the boxes to us. We offered to pay for the boxes, but he refused any payment. We were so relieved to get the bike boxes because we weren’t sure how it would work in Budapest to get boxes. We disassembled our bikes tonight without a problem, and they were ready to mail from the post office on Monday. With our big task for the day completed, we headed out to explore Buda. 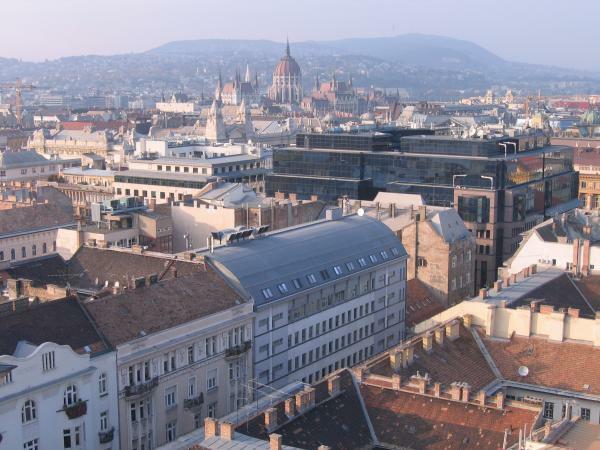 Budapest is actually two cities that have been merged into one. Buda is the city on the west side of the Danube, and it is very hilly with the royal palace and the citadel. 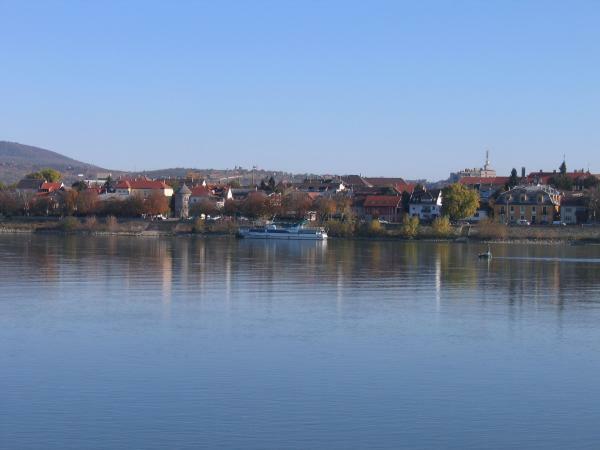 Pest is on the east side of the Danube, and it is flat and densely populated. Our hostel was in Pest. It was a beautiful, sunny day, and we took advantage of it. We climbed to the top of Gellert Hill for the best views of the city. 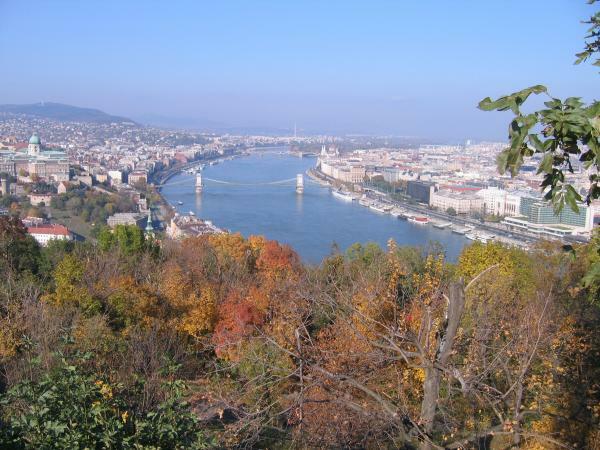 Gellert Hill was named after Bishop Gellert, who was sent to convert the pagan Magyars to Christianity. They did not respond very well his preaching, and they threw him off the hill to his death. Now, there is a big monument for him on the side of the hill. 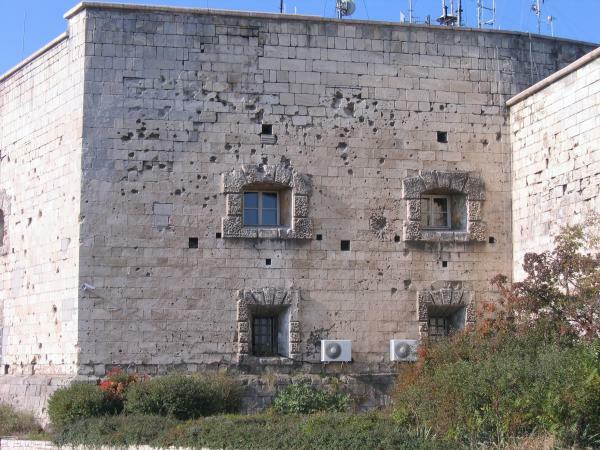 The citadel was at the top of Gellert Hill, and it still shows damage from the siege of Budapest during WWII. The Nazis used the citadel as their bunker during the war. The Soviets easily moved across the flat terrain of Pest and pushed the Nazis west across the Danube to hilly Buda, which was more easily defended. 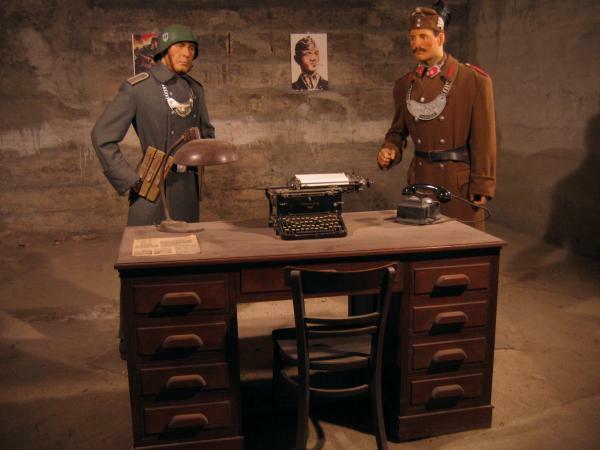 We went inside the old Nazi bunker under the citadel, which has been turned into the museum. It was crazy to wander around where the Nazi spent their final days in Budapest. The bunker had photos on the walls of Budapest from the siege, and it was crazy to see the destruction. The city was heavily bombed, and much of the city was destroyed. Today, the city has been completely rebuilt, and you can hardly see any damage from WWII. 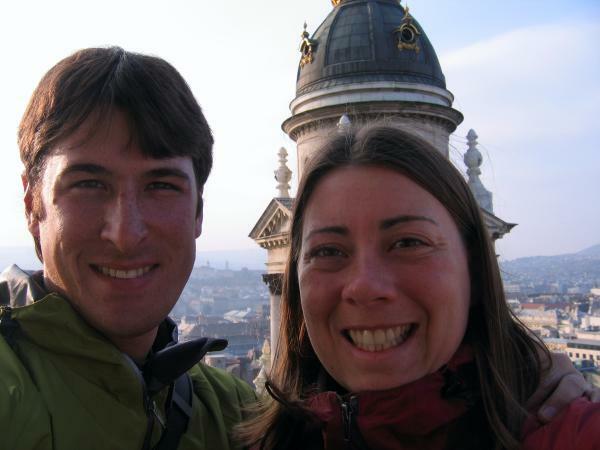 We descended from Gellert Hill, and we crossed the Danube back into Pest to find some lunch. 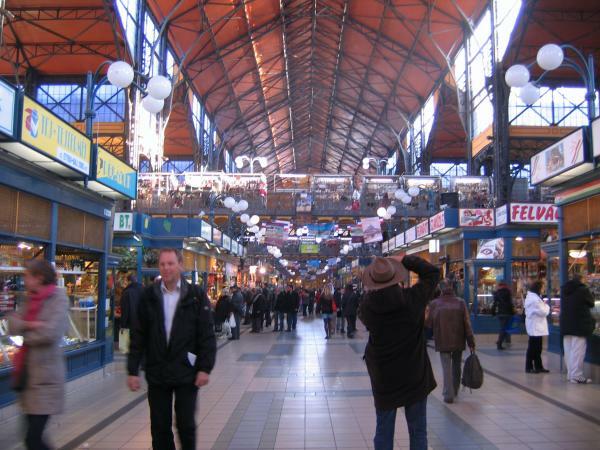 We went inside the Great Market Hall, which was a huge building with food stands, souvenir stands, and much more. It was too hectic and crowded to get lunch, so we found an gyro place instead and got some delicious gyros. Next, we headed over to Castle Hill. On the way, we walked along Vaci Utca tourist district where we were accosted by multiple hawkers trying to sell us tours. We went to the furnicular that takes people up to the top of Castle Hill, but it was 3 euros to go on it! It only costs $1 to go on furnicular in Dubuque, Iowa! So, we decided to walk up the hill instead. Castle Hill was a neat place, and we planned to return to walk through the labyrinths under the hill. This morning, we walked along Andrassy Utca with its neat old buildings and mansions. 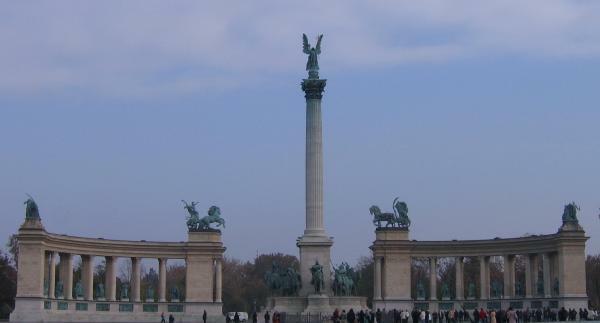 It lead us to Heroes Square with large sculptures of the seven horseman of the Magyar tribes and Archangel Gabriel giving the crown to Saint King Stephen. 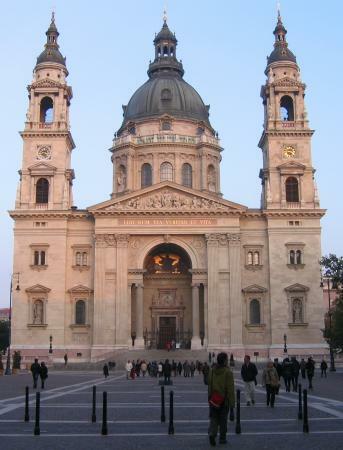 Budapest was founded in 896 by the Magyars, and for their millennium celebration in 1896, they built lots of buildings and monuments to celebrate the occasion. We walked around Millennium Park, and it was huge! There was small pond with ducks swimming in it, and there was steam coming off it. 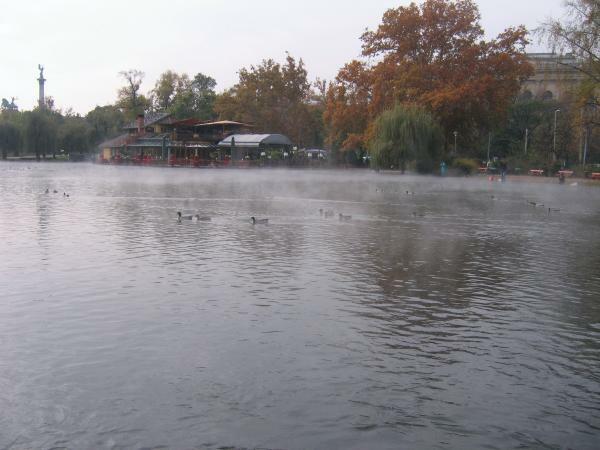 Budapest is known for its thermal baths, and this pond also had water that came from the thermal springs. We tried to find a place for lunch, but everything was closed because it was Sunday. We were almost forced to go to an American fast food chain restaurant after avoiding them for our entire trip. However, we managed to find another place to get gyros! After lunch, we headed over the Terror Museum, but it was closed due to the All Saints Day holiday. 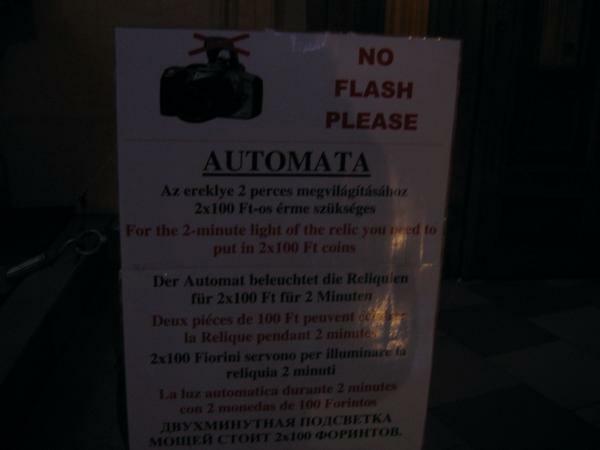 It would also be closed on Monday, our last day in Budapest, so we wouldn’t be able to go to it on this trip. 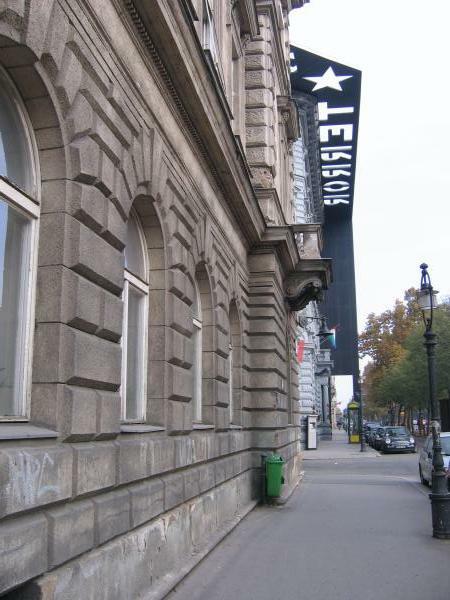 However, the Terror Museum was the only place that we wanted to see that we weren’t able to while we were in Budapest, so it was fine. 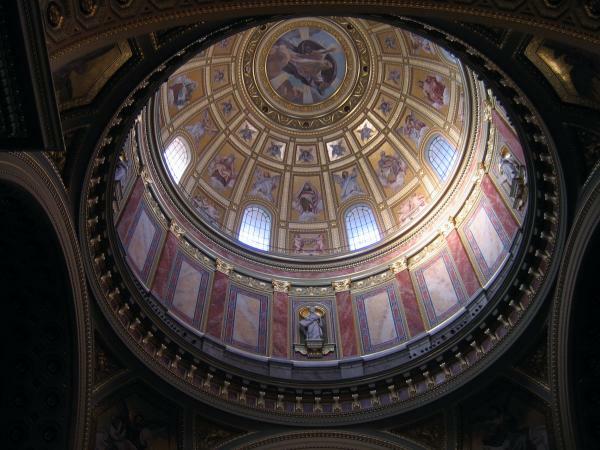 We went to the Basilica, and we went to the top of the cupola where we had an amazing 360 degree view of the city. We also walked around the inside of the Basilica, and it was really neat with the dome and beautiful red marble columns. 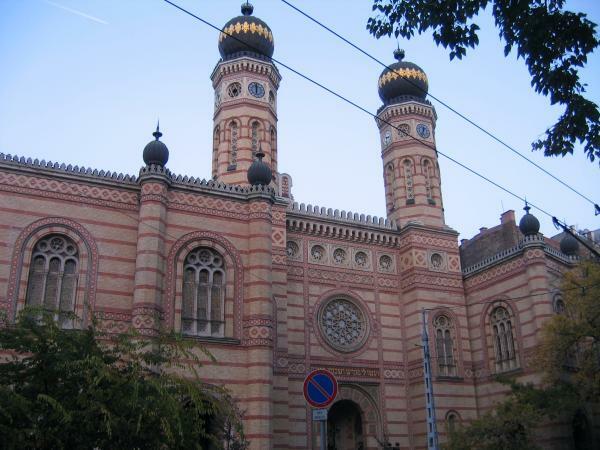 We also went by the Synagogue, which is the second largest synagogue in the world after the synagogue in New York City. 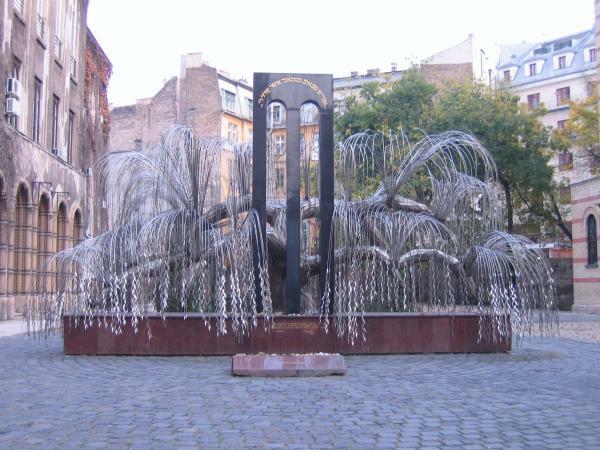 We walked around the Synagogue to check out the Tree of Life monument for the victims of the Holocaust. However, they had a big, iron gate around the monument that was closed, so we weren’t able to walk around the monument. We had seen a lot of vandalism and graffiti around the city, so we thought they might be preventing the monument from being vandalized. Our final stop for the day was the labyrinths under Castle Hill. At 6pm, they turn off the lights and give people oil lamps for wandering around. 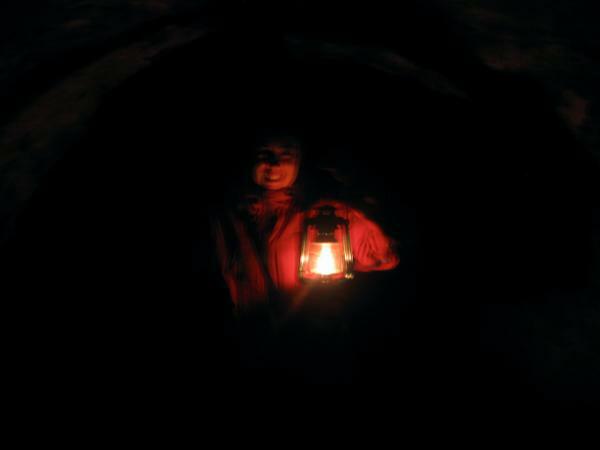 It was so spooky to be wandering around underground rooms in the dark. They had different sound effects in each set of rooms to add to the spookiness of the place. While we were walking around, we suddenly heard the noise of chains rattling, which was the creepiest sound effect of the evening. There were a couple rooms where you had to walk through a bunch of chains hanging through a doorway, and people ahead of us that we couldn’t see were rattling the chains as they walked through. We walked back to the hostel at night, and Budapest was a beautiful city at night! We wandered around the Royal Palace at night before heading back and checked out the spectacular view of the city from Castle Hill. This morning, we carried our big, heavy bike boxes several blocks to the post office. We filled out the forms to mail the bikes, but when we put the boxes through the window to be weighed, the mail clerk got out the book with all the rules on mailing packages. We knew this wasn’t a good sign at all. He gave us the bad news that our bike boxes were too big to mail from the Hungarian post office. However, the boxes were only slightly too large. So, we had to carry our bikes back to the hostel and figure out how to get them to the airport. A really helpful woman named Tini worked at the hostel, and she called some taxi companies for us to ask about a vehicle that would be big enough to take two bike boxes. She ended up finding an airport shuttle service that thought they could take the bikes. 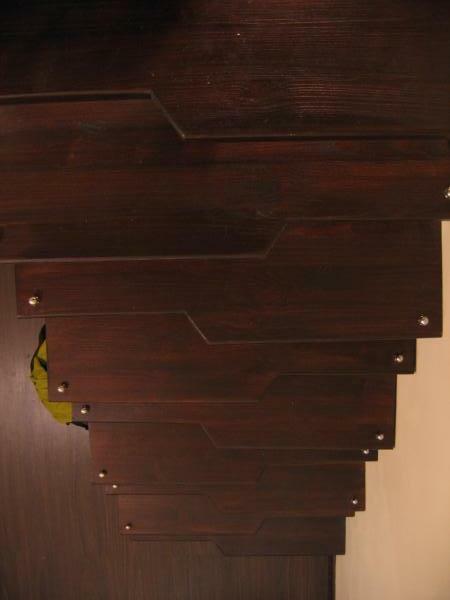 But, we had to call back with the exact dimensions of the boxes before we could make the reservation. Fortunately, the shuttle service said they could take us and our bikes to the airport! It was a great relief to have that figured out. However, we had no idea how much we would be charged to take the bikes home with us on the plane. We were flying with Northwest, and they do not operate directly out of the Budapest airport. Our flight from Budapest to Amsterdam would be operated by Malev Hungarian Airlines. We weren’t sure if we would be charged the fees for Northwest or Malev or if we would be charged twice by both airlines. Malev charged 6o euros per bike, and Northwest charged 300 euros per bike. We actually were charged 300 euros for both bikes, which was much less that we were expecting to pay flying on Northwest, so we didn’t argue with them. We have no idea how they calculated how much it would cost to take the bikes on the plane. Once we had our bikes taken care of, we went on a walking tour of the Statue Park. We happened to be the only two people that showed up for the tour, so we ended up having our own private guide for the tour. The woman who was our guide was really good. She grew up in Budapest during the Communist regime, so she told us what it was like to live in the Eastern Bloc. It did not sound like a pleasant way of life. People had no choice in anything. All the companies were nationalized, so they produced the same type of goods. Everyone had the same furniture in their houses, and the kids had the same toys. You also had no choice in where you worked. You were assigned a place of employment by the government. After the collapse of communism, it was a huge adjustment for people because they were not used to looking for jobs. You were also living in fear all the time because there were secret police and informants everywhere, and you could be taken by them at any time. (1) It is the infinity symbol because communism seemed to go on forever without an end in sight. 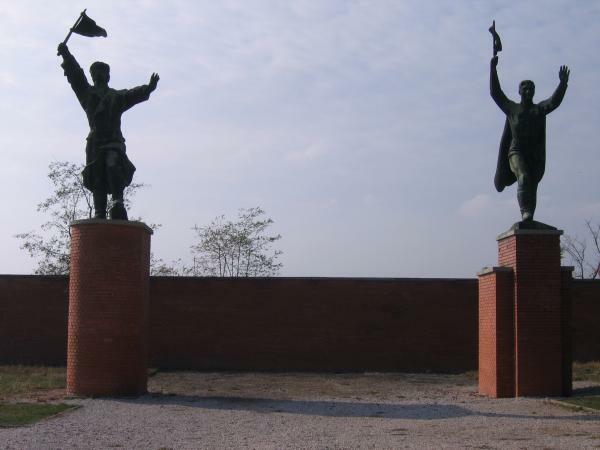 Throughout the park, there are the old communist statues. Some of the statues are enormous, which was intended to make you feel small and unimportant. There was a statue of only two huge boots. It used to be an enormous statue of Stalin, but it was torn down after the 1956 uprising against communism in Hungary. They had trouble taking down the statue because it was so large, so they finally just cut the statue at the knees. The statue was completely demolished, so the boots at the park were a replica. Our guide said that many people took a piece of the Stalin statue home with them as memento. Many of the statues were of poor quality and rusted. People did not take much pride in their work since everything they produced belonged to the state. 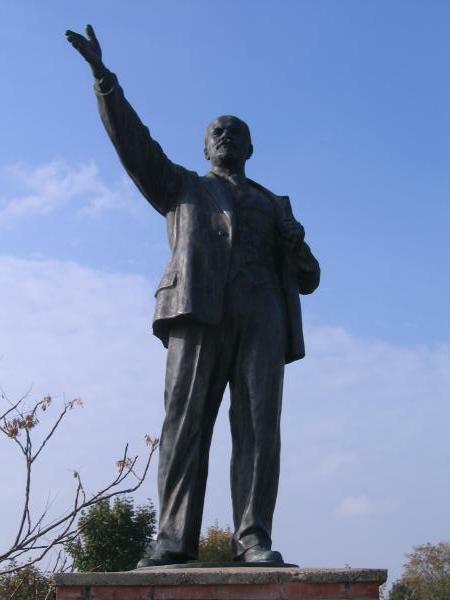 One statue of Lenin was placed outside a huge metalworks factory that employed 60,000 people. It was placed there to “motivate” the workers. However, it was ironic that the statue was of such poor quality that in a couple months, it began to rust. They didn’t want people to know that the statue needed to be replaced, so they put a new, identical statue in place of the old one in the middle of the night. The workers became very attached to the Lenin statue. 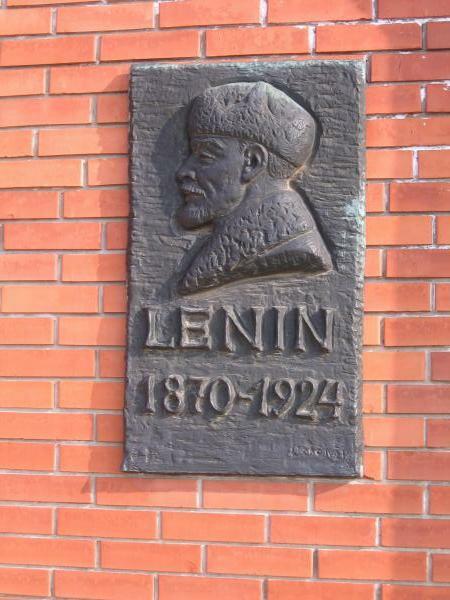 After the fall of communism, the workers of the factory removed the statue and hid it so that it would not be damaged. 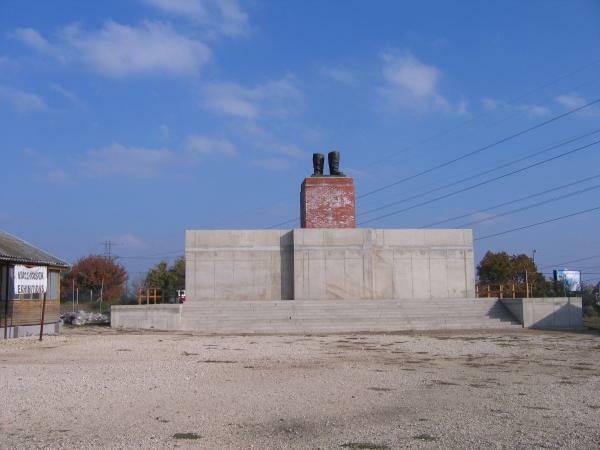 Each district in Budapest donated a statue for the park, and a different statue was placed in the park until they found the Lenin statue hidden in the basement of the factory. 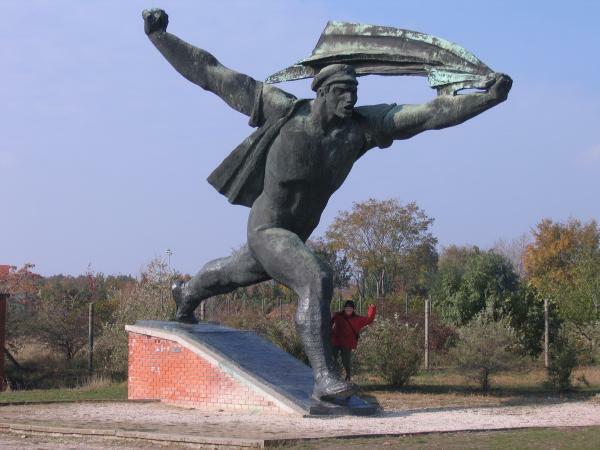 There is another statue of a man holding a Communist flag that became emblematic of Communism and was frequently used in Communist propaganda. The Hungarians would joke that the man is actually holding a beach towel and saying “Vamos a la playa!” (Let’s go to the beach!). 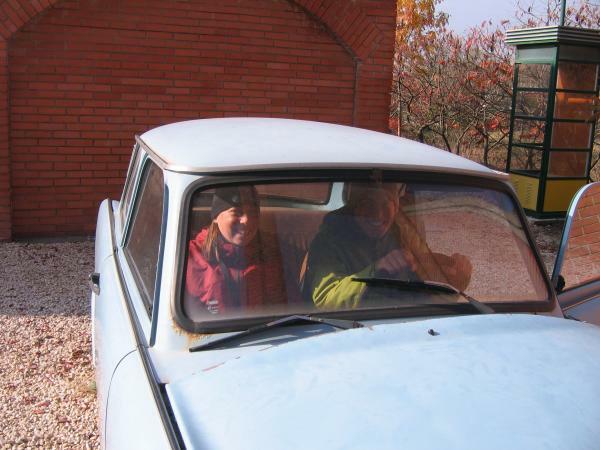 They also had an old Trabant car at the Statue Park. You could go inside the car and also take a look under the hood. Apparently, you can buy one for $50-100! They are terrible for the environment because they have a two-stroke engine, but they are super cheap to buy and run. We saw quite a few of them still being driven when we were riding in the countryside. After the fall of Communism, the people of Budapest renamed the streets that were named after Communist figures. Many were renamed after the Austrian rulers, implying that Hungarians would rather be ruled by the Austrians than to live under Communism. Our guide said it was really confusing when they renamed the streets, and many people had more than one address for a while. When we finished the walking tour, we walked around Budapest a bit more. We visited the statue of Imre Nagy. He served as Prime Minister of the republic that was formed after the 1956 rebellion. When the Soviets crushed the rebellion, he was executed as a traitor and buried in a hidden location in the hills of Buda. After the fall of communism, the location of the grave was revealed, and Nagy was rehabilitated and reburied with an elaborate funeral ceremony. 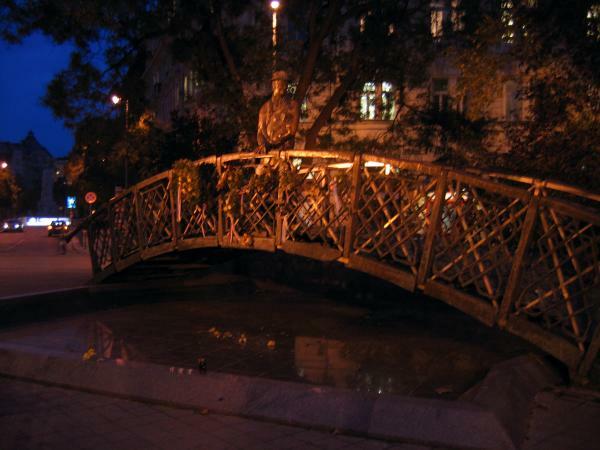 Nagy is a beloved figure by Hungarians, and at the statue, there was a huge pile of flowers and wreaths for him. We walked by the Parliament building, but they had some kind of official proceeding going on there. There were lots of soldiers posted around the building, and they watched us as if we were terrorists. We returned to the hostel and began packing up to leave tomorrow. I was sad to be leaving Europe because we’d had a great time on the trip, but I was ready to go home. We’d been gone a long time, and I was looking forward to returning to familiar surroundings and sleeping in the same place every night. Today was our final day of riding! It was a beautiful, sunny day! 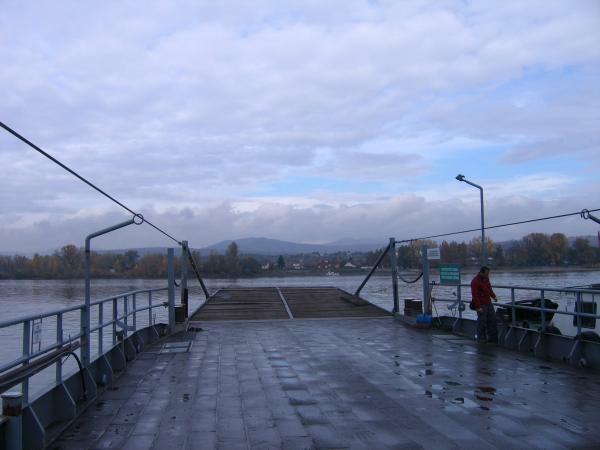 We started off by crossing the Danube on a ferry at Vac, and then, we rode down the Szentendre Island, which was where the Danube splits into two streams at the Danube Bend or Knee. Trabant car on the ferry! 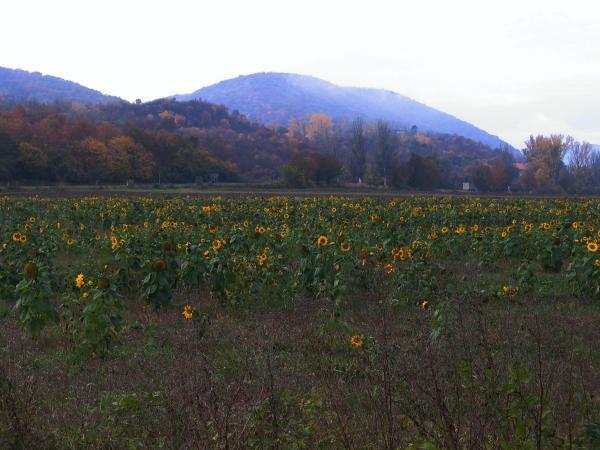 We had a nice, easy ride through the countryside of Szentendre Island. 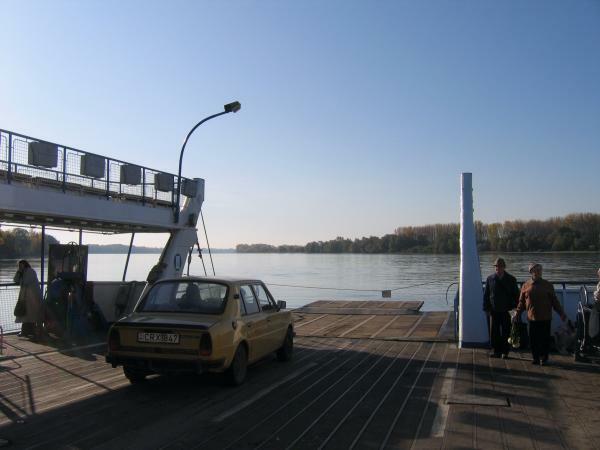 Then, we took the second ferry of the day across the Danube to the mainland and the city of Szentendre. 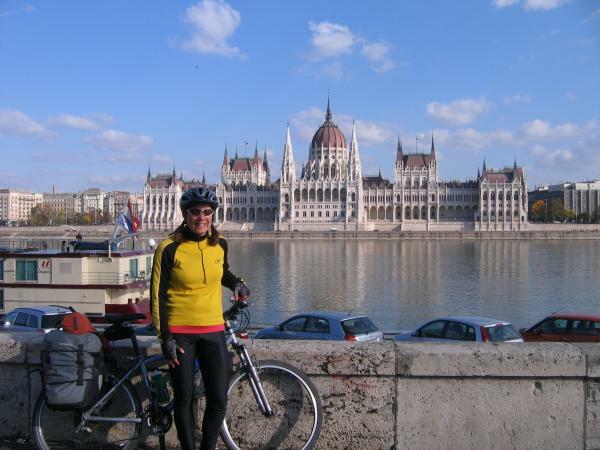 Then, we rode along the Danube towards Budapest. The ride was easy until we got into the city. 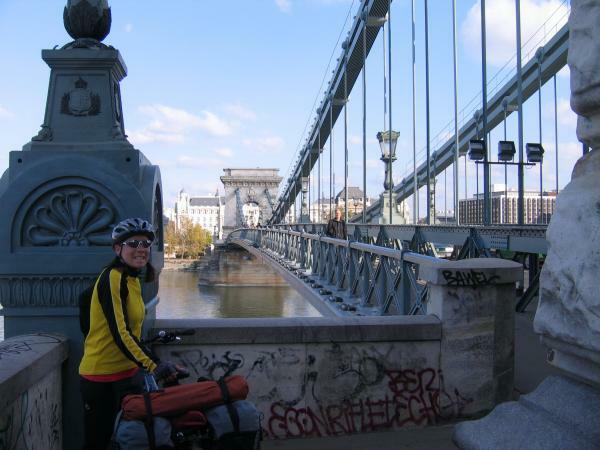 We had to wind through the city streets to follow the bike route, but we made it Budapest! We made it to Buda! We found the first hostel on our list, the Boomerang Hostel. At first, we weren’t sure where to go. We knew we were at the right building because it was the right address and the same building on the hostel pamphlet. Finally, we found the door to the building, but we had to push “11” on the buzzer to talk with someone at the hostel. The only room that had available was actually an apartment. It was more expensive than a room. But, since we were going to be staying in Budapest for several days and needed to pack up our bikes to send home, we decided to go ahead to book it. The apartment was really nice! 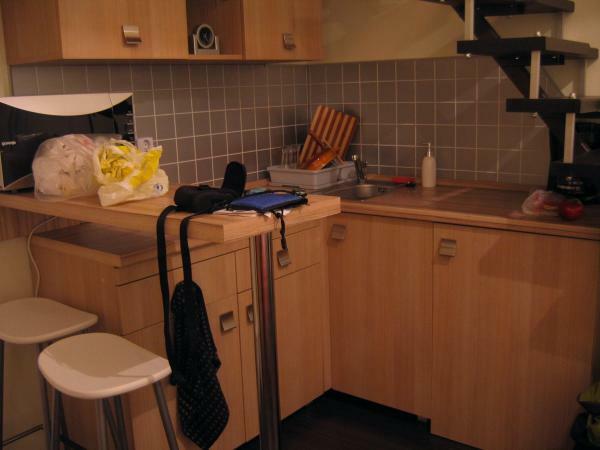 We had a kitchen, TV, private bathroom, and a loft for the bedroom. Our goal for the day was to figure out how we were going to get the bikes home. Since it was so expensive to take the bikes on the plane, we decided to try to mail the bikes home from the Hungarian post office. We went to the post office to see if it would be possible to mail the bikes. We talked with three different people, but we finally talked with someone that told us that it would not be a problem as long as the bikes were under 30kg. Then, we tried to find packing tape and a marker for packing up the bike boxes. We found the marker, but no tape. Finally, we tried to get bike boxes from one of the bike shops marked on our bike map. We walked a long way to go to the bike shop, and we looked all over and couldn’t find it. So, we decided to be smarter about our search for a bike shop that would have bike boxes, and we looked up bike shops online. We found a bike shop that was literally across the street from the hostel. Tomorrow, we hoped to find a bike shop where we could get bike boxes and also packing tape! Despite our limited success in getting our bikes ready to send home today, we had a great time walking around Budapest. It was a really neat city, and we were looking forward to spending the next few days here. However, we would enjoy our time more once we got the task completed of figuring out how to get our bikes home. Today, the weather took a turn for the worse. It was cold and rainy when we started out in the morning. 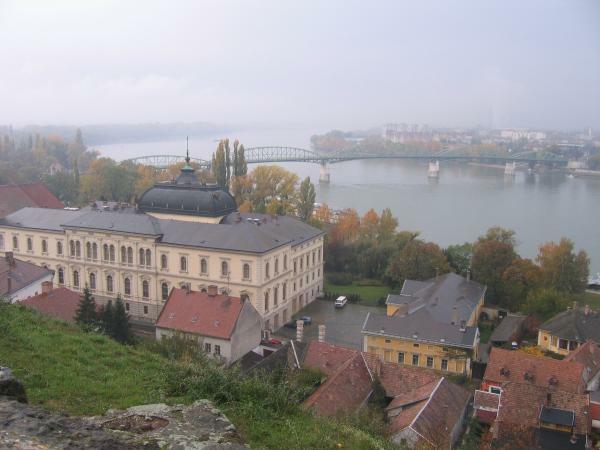 We hiked up to the basilica in Esztergom to check out the view of the city and the Danube. Since it was raining, we could not see as much, but it was still a neat view. The rest of the ride was very pleasant. There were a few short stretches along busy roads, and we primarily rode along bike paths and quiet country roads. Despite the weather, this was one of my favorite sections of the Danube bike route. There were big mountains rising from both sides of the river, and the leaves of the trees were changing color making the scenery very beautiful. We stopped in Vac for the night. We stayed at a pension that was run by the most friendly older couple. When we arrived, the man offered us shots of really strong cognac. Jonathan did not want his shot, so the man drank it for him. 🙂 He also gave us apples, and told us to eat them for “good vitamin”. They had a son that worked as a dentist in Atlanta, so the man spoke a little English. We talked to them a little bit about the United States. In the morning, the woman cooked a huge egg and ham breakfast for us, but I do not eat ham. However, I felt bad refusing to eat the breakfast she had cooked for us, so I ate it. It was really good despite the ham. 🙂 The couple were so friendly and helpful that they also helped us load our bags onto our bikes in the morning. When we were relaxing in our room at night, we were watching Hungarian television, and we happened to catch an old episode of American Gladiators from 1991! It was so funny to watch a show in Hungarian that we watched as kids. 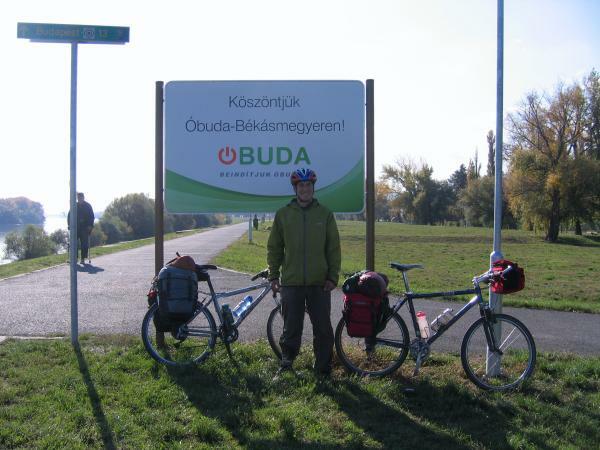 We were only 37km from Budapest, so tomorrow we would finally arrive in Budapest!